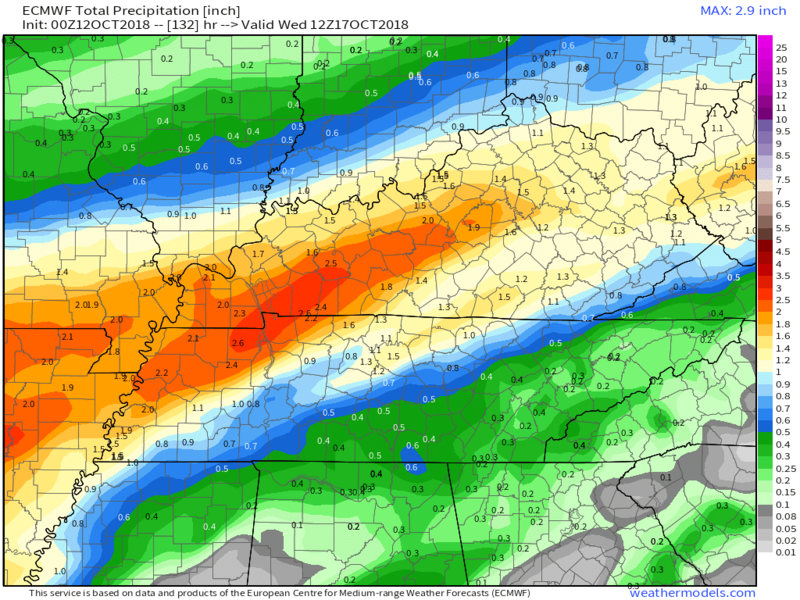 October 12, 2018 Non-subscriber WeatherTalk blog update. Rain chances. Here is the preliminary winter temperature outlook from the long-range meteorology team. This outlook is for subscribers. 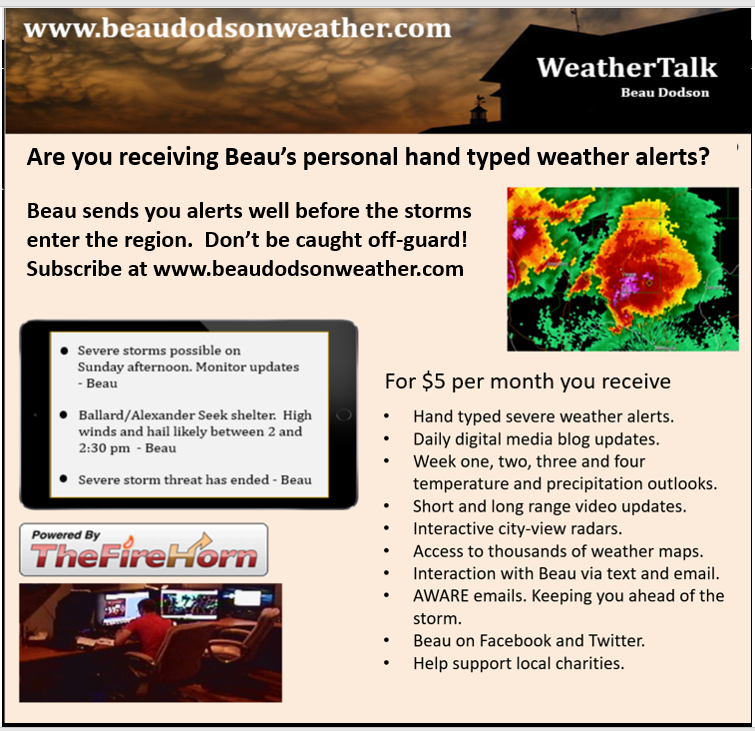 You can view the winter outlook on the subscriber digital media blog. Once you are on the latest digital media blog outlook, you scroll down to the middle/bottom of the page. You will see the graphics with the initial winter forecast thoughts. Friday forecast: Mostly sunny during the morning. Increasing clouds through the day. Light rain developing from west to east during mainly the afternoon hours. Coverage of precipitation: None early and then increasing coverage during the afternoon and evening hours. Light rain. What impacts are anticipated from the weather? None during the morning. Wet roadways during the afternoon and evening hours. Should I cancel my outdoor plans? Not during the morning. Afternoon hours will likely see rain appearing on radar and moving west to east through the area. Forecast: Mostly cloudy early. Light showers possible before 12 AM. Chilly. Clearing late. Coverage of precipitation: Patchy light rain possible. Frost Risk: Most likely no frost, but monitor updates. What impacts are anticipated from the weather? A few wet roadways before midnight. Should I cancel my outdoor plans? Have a plan B and monitor radars. Some light rain is possible in the region. Saturday forecast: Cool. Some morning clouds. Becoming sunny. Late in the afternoon, a few more clouds may spread into the region from the southwest. Forecast: Increasing cloud cover. Rain developing from southwest to northeast. Most of the rain will occur late in the night. The first part of the night should remain dry, but monitor updates in case the rain arrives earlier than anticipated. Coverage of precipitation: Increasing rain coverage through the night. Should I cancel my outdoor plans? Have a plan B and monitor updates. Rain should spread from southwest to northeast. It is possible the rain holds off until later in the night. Rain will arrive first along the Missouri and Arkansas border. Sunday forecast: Mostly cloudy. Rain likely. An isolated thunderstorm possible. What impacts are anticipated from the weather? Wet roadways. Lightning possible. Forecast: Mostly cloudy. Rain likely. An isolated thunderstorm possible. Chilly. What impacts are anticipated from the weather? Wet roadways. Low risk of lightning. Monday forecast: Quite a few clouds. A chance of rain showers. Chilly temperatures. Forecast: Disagreement in data about Monday nights forecast. Guidance shows another potential rainmaker. I will be monitoring this. A few showers before midnight. Clearing and chilly. Patchy fog possible. Frost possible if the wind dies down and if we don’t have clouds and rain. Clouds and rain would prevent frost. Frost Risk: Frost possible Monday and Tuesday night. Monitor updates. What impacts are anticipated from the weather? Some wet roadways. Monitor the risk of frost. Those with sensitive outdoor plants will want to monitor the frost risk. Tuesday forecast: Partly sunny. Cool. Forecast: Mostly clear. Chilly. I will be monitoring the risk of frost. What impacts are anticipated from the weather? Monitor the risk of frost. Those with sensitive outdoor plants will want to monitor the frost risk. Forecast: Mostly clear. Cool. Frost possible. What impacts are anticipated from the weather? Perhaps frost. Monitor updates if you have outdoor plants that are of concern. Thursday forecast: Mosty sunny. Milder. Here is the latest WPC/NOAA rainfall outlook. This first graphic is through Saturday morning. This covers today’s light rain event today and tonight. 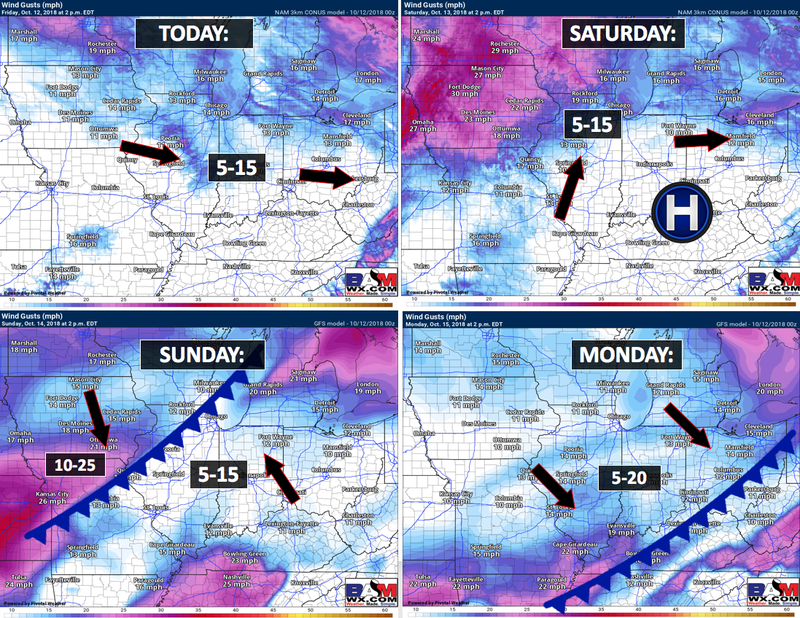 This next graphic covers today’s event and then the Saturday night through Monday event. 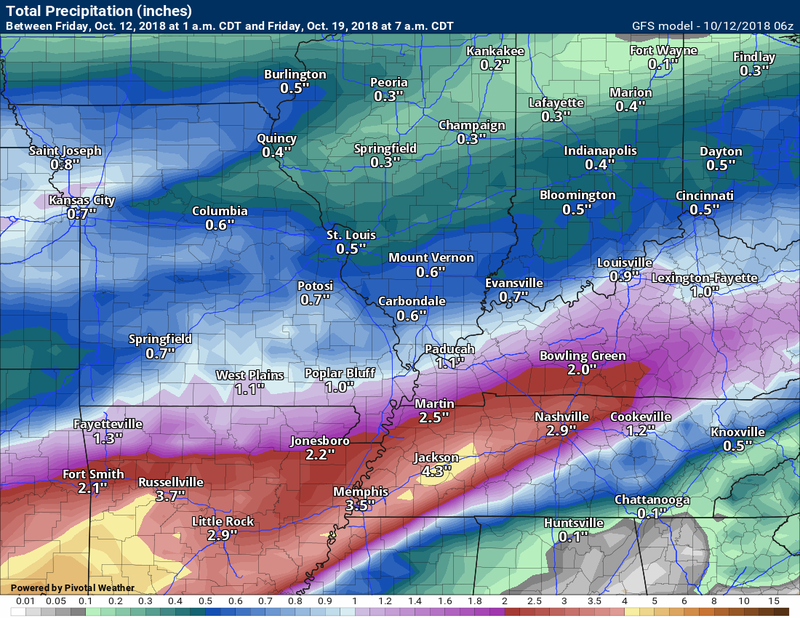 Look at the EC model guidance rain totals for today and tonight. It is a bit lower than some other models. Either way, today and tonight is a light rain event. EC guidance shows the heavier totals Saturday night into Monday morning. 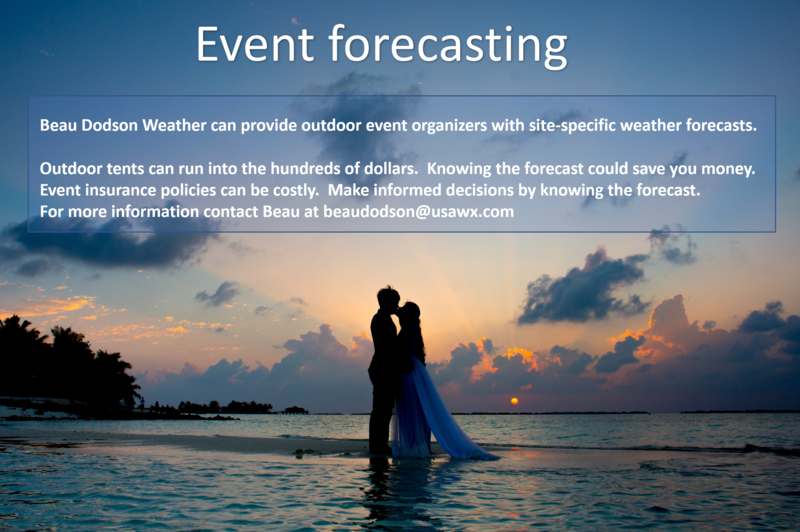 Need a forecast for an outdoor event? Today through Thursday: Severe weather is not anticipated. Isolated lightning risk Saturday night into Sunday night. Risk of lightning appears to be low with little to no instability. It was a chilly night across the region. There were even a few upper 30’s. A friend in Marion, Illinois reported a little light frost. Perhaps we will have autumn after all! A light rain event will spread across the region today from west to east. 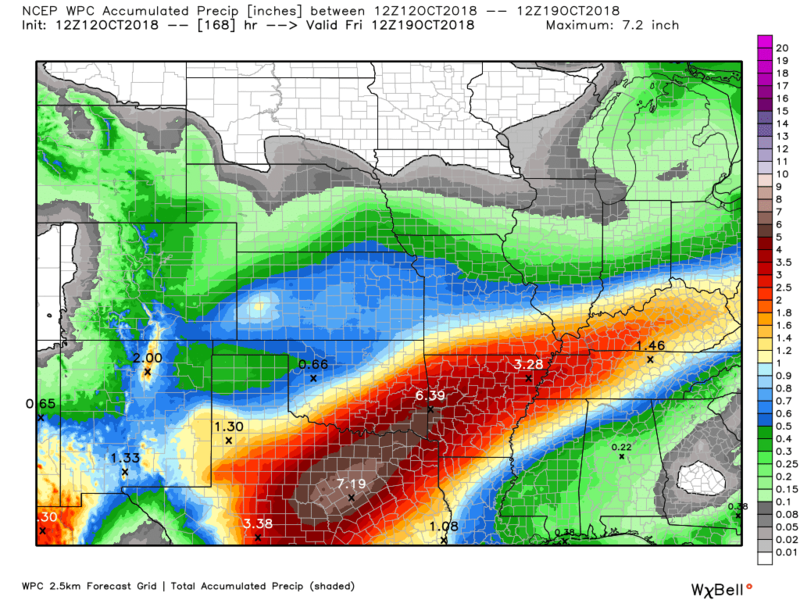 Rainfall totals will likely remain below 0.20″. Here is the future-cast radar from the NAM model. This is what radar might look like today into tonight. This won’t be exact. It is a model. Take the general idea from it. The rain will first arrive in southeast Missouri. Rain showers will end tonight. At this time, it appears that clouds and winds will keep frost from being a concern. 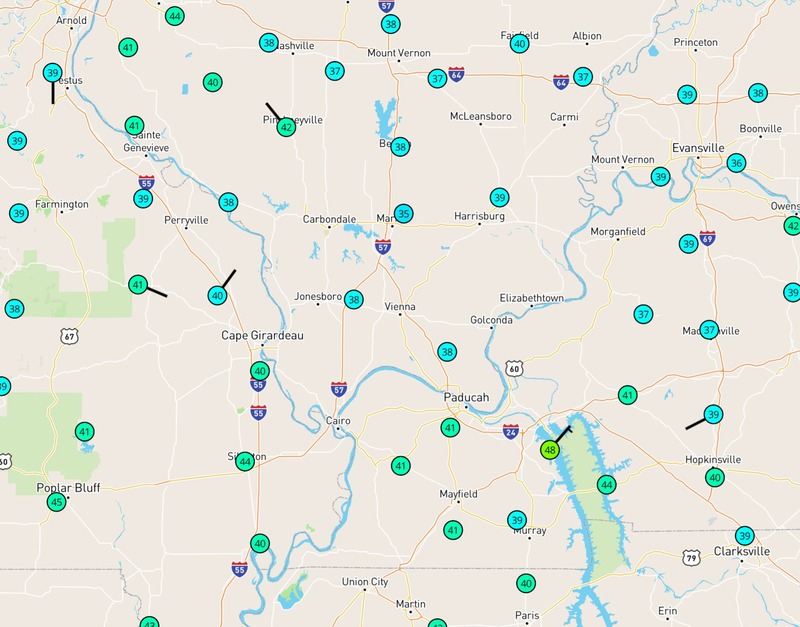 We could see temperatures dip briefly into the upper 30’s over northern portions of southeast Missouri and southern Illinois. I am more concerned about frost next week. 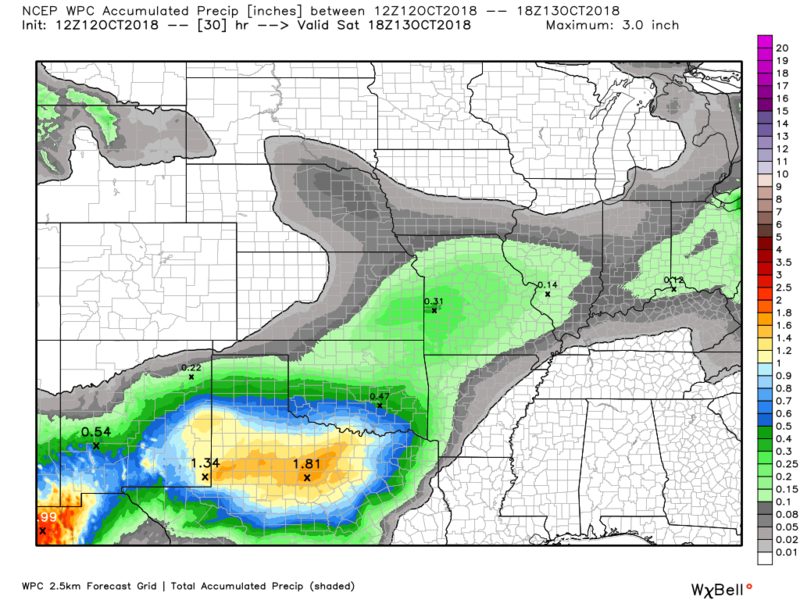 Radar totals from the NAM model. Notice wave one today and tonight. Saturday night and Sunday will deliver wave two. These are estimated rainfall totals. It will remain cool today with high temperatures only in the 50’s. Saturday will likely remain dry through 4 PM. It will again be cool with high temperatures only in the 50’s. Autumn weather has certainly arrived on the scene. Clouds will increase Saturday afternoon. This will be an indication of a stronger storm system approaching the region. Clouds will lower and thicken Saturday night. Rain will overspread the region from southwest to northeast. Some of the rain could be moderate, at times. Many of you have outdoor activities early Saturday night. Early evening activities should be okay. I can’t completely rule out a few showers during the evening along the Missouri and Arkansas border. Monitor updates if you have concerns. Rain will completely overspread the region late Saturday night into Sunday afternoon. Rain showers may linger into Monday afternoon. 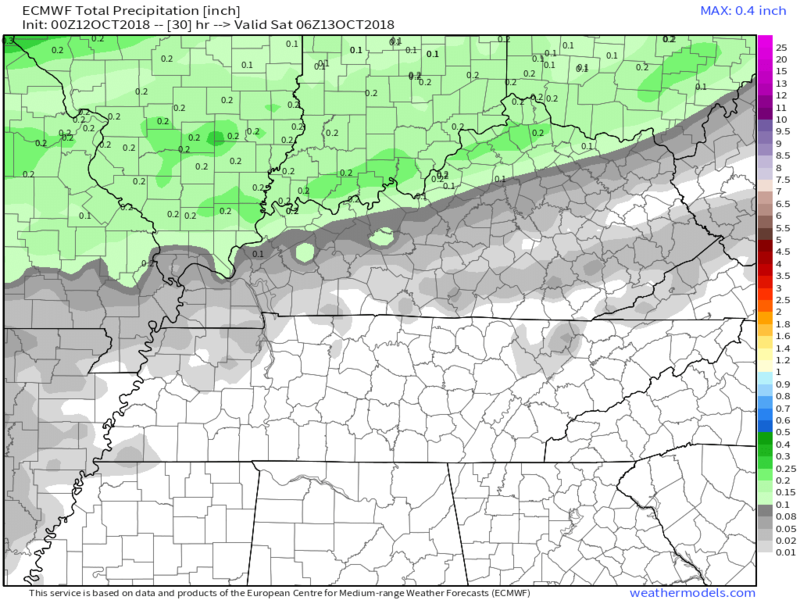 The model guidance does not agree about a second wave of precipitation Monday night. This is important because frost is possible Monday night if the clouds clear. Here is the future-cast GFS radar. GFS is a lower resolution model. It tends to show a bit more precipitation coverage than verifies. Either way, our second wave of rain arrives Saturday night (esp late) and continues on and off into Monday. Click images on this page to enlarge. For now, I have mentioned the possibility of frost Monday night. I also mentioned that the forecast may need adjusting. Low confidence in the Monday night forecast. If we end up with more rain and clouds then the frost risk is reduced. Here is the preliminary fall outlook from the long-range meteorology team. Click to enlarge this graphic. The September forecast has been updated. Joining us as our Guest WeatherBrain this week is a hydrologist in the Research Applications Lab at NCAR. He has a background in hydrology, geology and computer science. 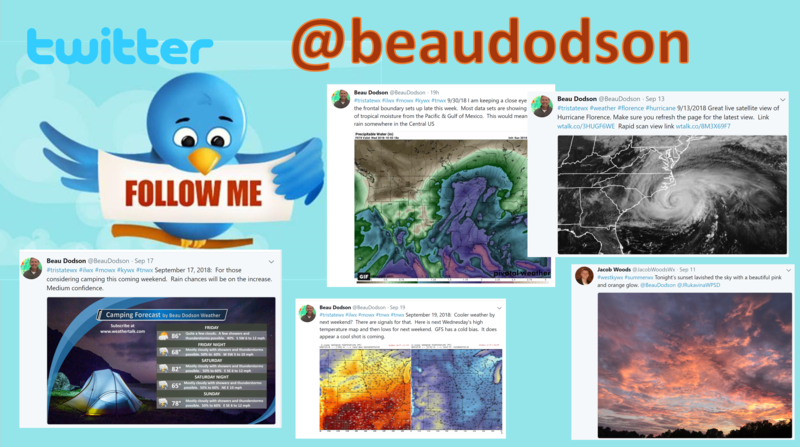 In graduate school, he found a happy marriage of these in hydrological modeling, remote sensing, and more recently atmospheric modeling. Ethan Gutmann, welcome to WeatherBrains! Should we re-do hurricane classification? October 13, 2018: Update for everyone. Rain is on the way.